Home DOST Mayon Volcano PHIVOLCS PHIVOLCS Update for Mayon Volcano, 19 February 2018. PHIVOLCS Update for Mayon Volcano, 19 February 2018. 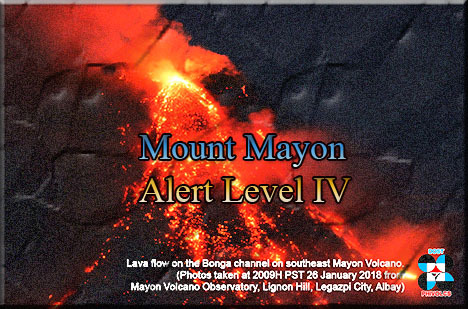 PHIVOLCS: MAYON VOLCANO BULLETIN 19 February 2018 8:00 A.M.
DOST-PHIVOLCS Mayon’s activity in the past 24 hours was characterized by sporadic and weak lava fountaining, lava flow and degassing from the summit crater. Six (6) discrete lava fountaining episodes that lasted ten (10) to twenty-three (23) minutes were recorded by the seismic network. These generated dirty white to brownish ash plumes that rose to two hundred fifty (250) meters above the summit crater before drifting southwest. Three (3) episodes of lava collapse pyroclastic density current (PDC) events were visually observed yesterday between 5:57 AM and 9:16 AM in the Basud and Bonga-Buyuan Gullies. Lava flow sustained at 3.3 kilometers, 4.5 kilometers and 900 meters on the Miisi, Bonga and Basud Gullies, respectively, from the summit crater. Pyroclastic density currents or PDCs remained confined within the farthest recorded reaches of 4.6, 4.5 and 4.2 kilometers on the Miisi, Bonga and Basud Gullies, respectively.